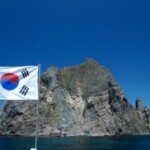 HOME » Island Issues » South Korea/Japan: Dokdo or Takeshima – that is the question! Though the rest of the world may not hear much about these tiny islands in the Sea of Japan (East Sea), the conflict is big news in Korea, where according to Steve, 40% of people consider it to be the biggest historical issue of contention to date between Korea and Japan. The natural conclusion may be to assume that Steve is rooting for adopted country Korea, however, he has spent years researching this story from historical, cultural and geographical perspectives of both sides of the story. Having read other western news reports and papers written by interested scholars, it seems that a rather convincing argument is being made for Korea. 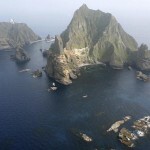 Dokdo as the Koreans call it or Takeshima as the Japanese refer to it, is located some 87 kilometres from the Korean island of Ulleung and currently administered by South Korea, which has its coast guard stationed there. 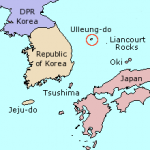 The small group of volcanic islands is roughly the same distance from the mainland of South Korean and Japan, and is also referred to as the Liancourt Rocks, after a French whaling ship which was almost wrecked on the islands in 1849. The island has a population of two permanent Korean residents, a couple who makes a living off fishing, as well as a team of almost 40 Korean police officers, who permanently guard the craggy rocks. 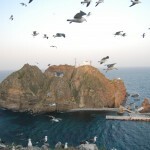 Hearing more and more about Dokdo, Steve began discussing the issue online with Japanese and soon felt the need to gather as much information as possible – historical records, video and photos – in order to get a clear picture for himself about which country has a legitimate claim to the islands. Avoiding the various government lobby groups, instead Steve collaborated with Yongnam University in Daegu, which helped him translate his website on the subject into Korean and Japanese. So what are the countries doing about it? “Korea and Japan are doing nothing to resolve the problem. Korea feels there is nothing to discuss and that any concessions given to Japan could be misconstrued as a degradation of sovereignty over these rocks”, Steve explains. So for example, Korea would not allow Japanese fishermen to fish in the adjacent waters, because it could be taken as a legal basis for Japan to claim that the islands are not Korean. For its part, Japan recently released school books in which the island was marked as being in Japanese territory. Korea has countered such actions by increasing real acts of sovereignty over the islands, such as beginning the construction of a research centre near Dokdo and upgrading the docking facilities there. In the past, Japan suggested going to the international courts of justice in Europe, which resolve such territorial disputes, however Korea has never agreed to such action. In an article published early this year in the Korean Times, (see: http://www.koreatimes.co.kr/www/news/nation/2011/05/113_86292.html) Steve elaborates on the results of his years of research, which point to the legitimacy of Korea’s claim and highlight the loop holes in Japan’s. Historical Japanese documents, which have been cited in other articles and reports, going back to 1904, seem to be the key to the issue. Unfortunately, the question of which country these islands belongs to has remained unaddressed at key points in the history of the region over the last six decades and therefore unresolved. These documents show an unlawful and military move by the Japanese to seize Dokdo. These records support the Koreans who say that Japan’s annexation of Dokdo was military aggression, since they were logged in late 1904 and January of 1905, before Japan incorporated the Korean easternmost island into Shiman Prefecture in February 1905. Additionally, Steve’s field research, including numerous trips to the islands and surrounding area, videos and photographs, has helped him get a better understanding of the regional geography, which in turn he believes strengthens Korea’s position. 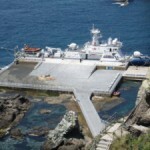 Ulleung’s tourism and fishing industries have always been heavily reliant on Dokdo, another point illustrating why these sister islands have been regarded as inseparable throughout history. Interestingly, photos and footage shot during the trips between the islands disprove Japanese claims that Dokdo could not be seen from Ulleung, again reinforcing Korea’s claim, since visibility played a role in defining territorial limits in ancient times. 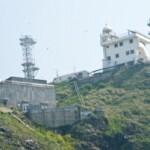 Though the majority of visitors to the islands are Korean, Steve explains that Dokdo can only be reached from Ulleung Island and there are many restrictions on visas, which is understandable since the island is disputed and there are guards armed with automatic weapons on patrol. He also adds that Dokdo is dangerous because of its treacherous cliffs but worth seeing if visiting the beautiful island of Ulleung.